Customers can check the account transactions, view account statement, transfer funds to other’s accounts within the bank and outside the bank as well. There is a facility to pay credit card bill, utility bills registered with the bank. The customer can order for Demand Draft (DD), recharge mobile/DTH services. The customer can issue standing instructions to a bank for the recurring payments to be made at regular intervals. The customer can submit the documents online that are required for transactions like – updating PAN, Update Passport Number, direct benefit transfer registration using Aadhaar, KYC documents submission etc. The customer can link the other facilities availed from Citi group – Personal loan, Home loan, Investments made (Deposits, Mutual Funds, Shares, and Securities), Credit card and Insurance to the same login id used for online banking transactions. The customer can download Citi mobile app that can be used to do many banking transactions using a mobile phone. Customers new to internet banking should register for the service by submitting an application that looks as follows. To open the application, the customer should click the first time user option on the home page. In the first step, provide the account related information, the account type by selecting your account type in the drop-down menu provided. In the second step, authenticate the account information by providing the 16-digit credit card number, CVV number that is listed on the reverse of the debit card, passport number or the Zip code and the Date of birth. After providing the details, go through the terms and conditions and then check the “I agree to these terms and conditions” checkbox. Click on proceed. Provide the one-time password that is sent to the registered email address. and the ATM personal Identification number to authenticate your account information. Now, in the third step, select the user ID that is a mix of alphanumeric without any spaces. The special characters underscore, at the rate and dot can also be used to frame the user ID. 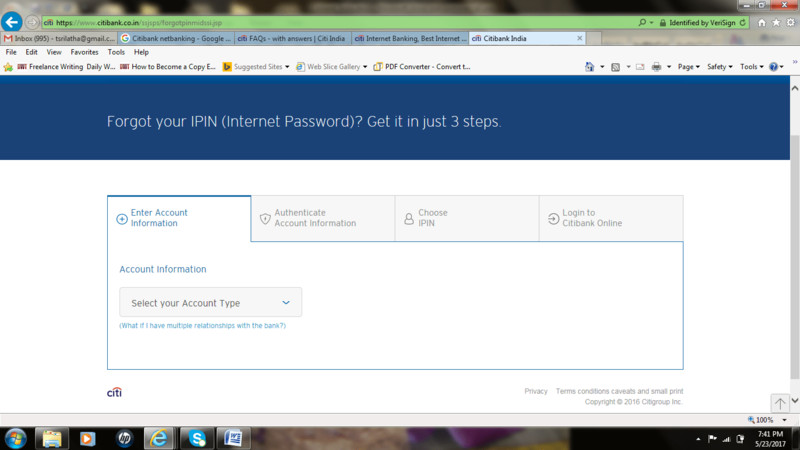 In step 4, after selecting the user ID, select the internet banking password. Make sure that the internet banking password is easy to memorize and enter but is hard to intercept by others. The password can be up to 16 characters. Both the password and the username should not have blank spaces. Finally, after submitting the username and password, the customer can login to the account online by using the set password and the username. The Citibank Net Banking platform provides a wide variety of services that cover the majority of the routine banking needs. However, the customers are recommended to stay away from fake sites for secure banking transactions. The highly secured banking platform has helped the bank obtain the award “Best Internet Bank 2016” by Global Finance. The banking platform is not only safe and secure, but is also fast and convenient to use, enabling customers to manage money easily. The Citibank online banking service helps the customers monitor the account, manage the account as well as operate the account. Citibank Net Banking service helps the customers to check the account related details such as check the different type of transactions in customer’s account and view the account statement related to the past 18 months. Checking the transactions related to the account, helps the customer identify any anonymous transactions or make a note of expenses. Online banking service can also be used to submit a request for receiving the Citi Alerts that helps the customer to obtain the important information related to the account security or any updated information related to the banking services. Customers with different types of accounts (Savings, Investment, Citibank Credit Cards and loan accounts) or those having accounts at different places can link all the accounts and use a single login to access the accounts online. Linking of accounts can be done online very simply without any hassles. The unique spend analyser helps the customers track the pattern of their money usage. 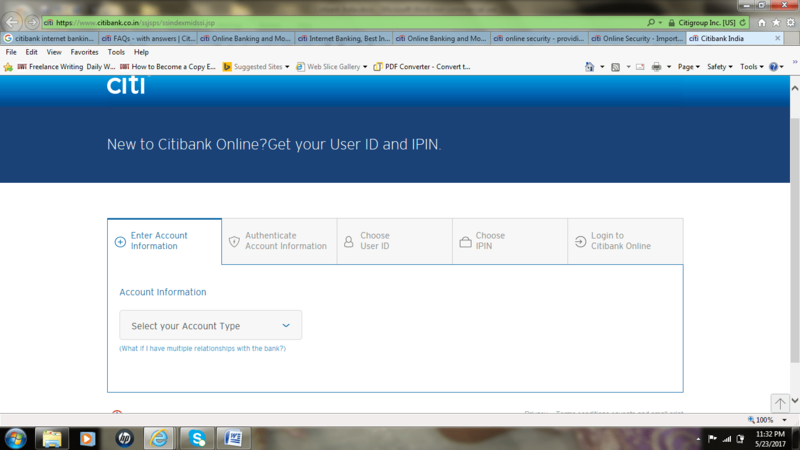 Another interesting feature of Citibank Net Banking services is managing the account. Users can obtain the account user ID and the password to access the account online, by submitting a request. Contact details such as address, phone number, or email address can be changed. Customers can make an explicit request for obtaining the e-statements and go green. The round the clock customer care service can be used to obtain any information related to the account and resolve any queries. The most interesting feature of online banking service that attracts most of the customers, is operating the account right from the comfort without traveling long distances to visit the bank branch and stand in long queues to submit a simple deposit opening request or other transactions. Using the online banking, customers can make a request for demand draft, transfer funds in between accounts within India as well as overseas using the NEFT, RTGS or IMPS services, pay a wide variety of bill such as the utility bills, pay insurance premium, shop online and more, pay the home loan linked to the Citibank Account, purchase mutual funds and also withdraw the deposits. Customers can provide a standing instruction to the bank, to make payment of monthly utility bills or the home loans linked to the Citibank directly before the due date. Online banking services also include mobile banking and tablet banking. The Citibank Mobile App service gives the customer the freedom of viewing and managing the account from anywhere, anytime safely and securely. To avail the mobile banking services, customers have to download the Citi Mobile app from the Google Play or the Apple app store. The application is available for free. The benefits of using mobile banking are: make transactions worth Rs. 10 Lakhs in just one day using the mobile and easy access to the account anytime from anywhere even while the customer is traveling. Apart from the banking account, customers can access the credit card account, loan account or any other account irrespective of its type. Notifications related to the account can also be provided using the mobile app. The Citi mobile App provides its users, the benefits of purchasing, managing or sell the mutual funds. Credit card related information such as the history of both billed and un billed transactions, latest credit card statement including the previous one can also be obtained. Credit card bill payment, EMI, and utility bill payment can also be made using mobile banking. Access to the account with use of a right combination of IPIN and user ID. Sophisticated 128-bit SSL encryption of the interaction between the bank website and the customer. Confidential information such as the credit card numbers is not displayed on the Citi Mobile. If a customer fails to provide the right IPIN consecutively for six times, then the account will be locked. The Citi Tablet App, makes banking possible using a tab. Tablet banking helps the customers view the account in a more clear graphical format that makes account management easy and interesting. Transactions can be made with just the swipe of a finger from anywhere anytime. The tablet banking service can be used to access any type of account – salary account, savings account, credit card account and others. All the recent transactions related to the account can be checked and well-organized as per the customer preferences. The graphical representation of various transactions helps you assess the expenditures and the savings and accordingly manage the expenditures as per the cash flow to prevent negative account balance. As with internet banking and mobile banking, tablet banking also allows customers to make money transfer using the NEFT and IMPS. The advantage of using the IMPS service is it allows for fund transfer even during the bank holidays. Banking using Citibank tablet app is safe, secure and easy-to-use. Citi tablet app provides the flexibility to pay the credit card bills, utility bills, insurance premium online without wasting time by standing in long queues or traveling far for a Citibank branch or the utility bill payment center. The services are available free of cost. However, check the biller associated page before making the bill payment. All the bill payments can be lined up for payment by providing standing instructions saving yourself from unwanted late fees or fine. An interesting feature of the Citi Tablet app is it allows for payment of the Mobile or DTH recharge instantly with just few swipes. An interesting feature available with the Citi Tablet app is that the customers can find the Citi Bank branch or an ATM nearest to them very easily by just providing the details of the location. Users of Citi Bank Tablet app can enjoy about 2,000 exciting dining offers. Find a restaurant or an eat away providing interesting offers valid on Citi Bank Tablet app and start enjoying. The app also provides information related to the other banking products offered by Citibank. Citibank adopts various security measures to ensure safe internet banking, online shopping, and mobile banking. Different measures adopted for safe internet banking are providing secured login, a virtual keypad to enter the username and the password and use of high-security encryption algorithms. The 128-bit encryption is used to encrypt the information exchanged between the customer and the bank website. This prevents the hacking of information. Use of virtual keypad to enter the user name and the password prevents the key logger software from trapping the confidential information. The change in position of the characters on the keypad ensures that the spyware and malware programs do not identify the password. Enhanced login security is provided with the use of double passwords. That is the customer is also requested to enter the One Time Password that is sent to the either the customer email ID or the registered phone number. The OTP remains active only five minutes and provides high security for online transactions. Checkout Union Bank Net Banking and HDFC Bank Net Banking banks for hassle free online funds transfer. Sensitive transactions such as transfer of money between accounts, opening a term deposit, adding a payee are processed only after multiple verification’s or authentications from the customer. The novel digital certificate feature of Citibank enables the customers to authorize the sensitive online transaction by digitally signing them. Some of the transactions that can be digitally signed are money transfers, NEFT, RTGS, IMPS, request for Demand Draft, upload huge amounts or salaries. To avail the digital signing feature, the customer has to register for the Digital certificate transaction signing. The online session terminates automatically if the customers fail to remain active or forgets to logout of the session. The automatic lock out features locks the account if the customer provides an incorrect password for three times consecutively. In such cases, the customer has to contact the customer care service to activate the account and provide personal information to authenticate themselves. Before using the Citibank official Website, the customers should check for the digital certificate from Verisign which is provided for secure sites. The availability of digital certificate is indicated by a green colored lock icon at the bottom of the web page. Customers can click the lock icon to view the complete details. Another interesting feature that helps customers distinguish a secure site from an unauthorized site is the availability of Extended Validations (EV) SSL certificate. Web sites with the EVSSL certificate show a green colored address bar. Citibank uses multiple firewalls to prevent unauthorized access to its servers and hence, the breach in account security. For a secure online shopping, Citibank uses an additional level of security apart from the routine Username and IPIN use. the customer has to provide the OTP sent to the mobile phone after entering the login details and password to complete the processing of the transaction. To enjoy secure transactions, mobile banking customers should cautiously download the app from a trusted and genuine site. The application can be securely downloaded from the App store on the iPhone or Google play. The application can also be downloaded by sending an SMS to 52484. A URL will be sent to the mobile phone, using which customer can download the app by visiting the site. Never download the app from third party websites. To prevent theft of information stored on the phone, customers should use strong password for the mobile phone, avoid using the account related information at public spots where chance of shoulder surfing is high, install an anti-virus to prevent spyware and malware, and never respond to email messages or an SMS requesting you to send the confidential information such as the bank account details and any other personal information. Disabling the auto save option to prevent automatic saving of the passwords. Installation of the latest anti-virus software and keep it updated by downloading the security patches as and when they are made available. Avoiding use of outdated browsers and operating systems. The browser should support the 128-bit encryption to ensure high security. Installation of the firewall to restrict unauthorized access. Disabling the print and sharing options while working online. Create a password for the account that is hard to interpret. It should be unique and a strong password with a combination of numbers, alphabets, and special symbols. Avoid saving the password in the system or writing it in a book. Request for an e-statement to prevent your statement from falling in wrong hands during delivery. The account information such as the last login has to be checked to identify unauthorized access to your account. Set an alert to the account so as to receive a message whenever someone tries to the access the account. Make sure to use single username and password for all the accounts by linking them. Citibank provides 24/7 customer care service for the Citibank Net banking customers. Net banking users can resolve the queries using any of the following customer care services provided by the bank. Citiphone: The Citiphone services provide the customers, the flexibility to call anytime to get the solutions for their queries. Indian Customers with queries related to credit cards, citibanking, suvidha, citi priority, business preferred, and loans can call the number 1-860-210-2484. Local charges are applicable when you make a call. Customers outside India can call at 91-22-4955- 2485. The latest, voice recognition feature of the Citiphone helps identify who the customer is with their voice. you can also check the other bank Customer Services SBI Customer Care, UBI Customer Care and Karnataka Bank Customer care. The frequently asked section provides a solution for most of the common queries. For any queries specifically related to the account, visit the nearest branch or make a call. General information and the latest updates related to the banking services can also be obtained at social media sites such as facebook. Forms such as those used for request of demand draft, online banking registration can be downloaded from the forms center in the customer care center page that is listed under Contact US tab on the home screen at the top left side. What is Citibank Internet Banking? Internet Banking makes banking and money management tasks easy and simple. The bank account can be accessed from anywhere, anytime without any hassles. To login the online account, the customer is required to provide the right combination of the registered User ID and the password. After making a request for online access, Citibank provides the customers with a User ID and password which can be changed later as per the customer choice. 2. 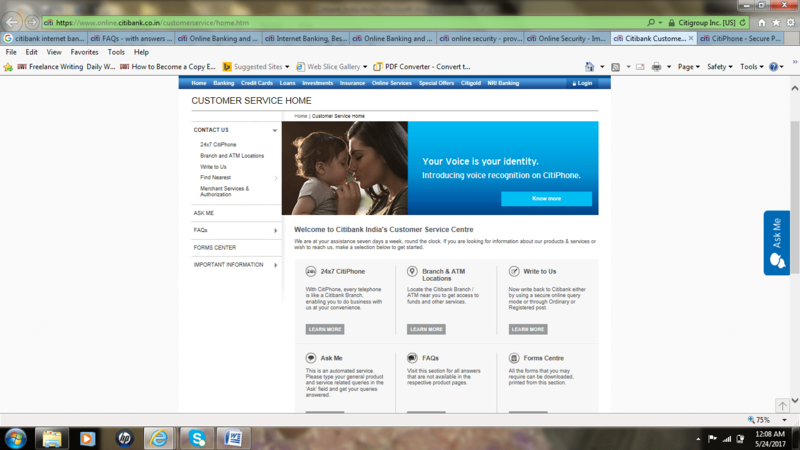 How to access the Citibank internet banking account securely? To access the account online, the customer has to access Citibank website, by providing the address of the Citibank website in the browser. It is highly recommended for the customers to not click on any of the links provided in the email to avoid visiting insecure fake websites. 3. What is meant by user ID and IPIN? An internet Banking user ID and Password (IPIN) are selected by the customer by giving the account details such as the number of credit or debit card and personal details. The IPIN generated electronically will be provided to the customer initially. The customer can change the IPIN anytime. 4. What happens if the customer fails to provide the right IPIN? After providing the required information, the customer is prompted to authenticate account information, choose IPIN followed by the login to Citibank online link. 5. How to transfer funds to another bank account within India? NEFT (National Electronic Funds Transfer) system or the RTGS (Real Time Gross Settlement system) can be used to transfer funds from one account to another account in India. Funds can also be transferred from the Non-Resident External or Non-Resident Ordinary Rupee Checking Account to any bank account. 6. How to Update the Contact Information? Customers should keep the contact information up to date as this information is used by the bank executives to obtain confirmation about any of the instruction provided by the customer and many other purposes. To update the contact information, the customer has to login the account, and edit the required details. At the end of the window, the customer is requested to provide the Online Authorization Code (OAC) that is sent to the registered mobile phone or the registered email address. After changing the contact details online, the customer is requested to send a signed copy of the notification of change of address request to the bank. Along with the letter, the customer has to provide the documents – valid passport, Voter’s Identity card provided by the Election Commission of India, a copy of the Driving license, Aadhaar card provided by the Unique Identification Authority of India. It should be noted that the contact information related to the Time Deposit Account cannot be updated online. The account instruction form has to be mailed to the Citibank office in Chennai, TamilNadu, India or at the nearest Citibank branch. 7. How to Make a Money Transfer from Overseas to a Rupee Checking Account in India? Citibank customers can transfer money from overseas to their account in India using various means – Citibank Global transfers, International wire transfer, and Automated clearing House which is open only for US customers). Customer to choose the option that is available in the nearest Citibank and the country of customer’s residence. Customers have to follow the daily limit for money transfer in both the countries (India and overseas) before making the transfers. Citibank India accepts the amount of up to 30,00, 000 per day. Customers should also check if there is any transfer fee associated with the transfer as in the case of ACH Transfer available for US customers. 8. Can a customer with Rupee Checking Account open new term deposit online? To open a term deposit online, the customer has to access the account online, fill in the deposit application form, scan it and upload it. The same can also be mailed to the Citibank office or the nearest branch in India. It should be noted that all the account holders should sign the application form before uploading it online or submitting at the bank. A bank executive will call the customer, to obtain confirmation of the request received. After receiving the confirmation from the customer, the deposit will be created.